One of the things we told ourselves before moving to Switzerland was that we would take advantage of the country’s central location within Europe and the availability of cheap short-haul flights from Geneva in order to visit as many places as we could during school breaks and on periodic weekends. However, between the kids’ sports commitments, homework assignments, party and sleepover invitations, and Kathryn’s work schedule, the reality of our first 5 months here was rather less ambitious and glamorous than originally envisioned. Most weekends found us standing in the rain on some small-town football pitch rather than exploring the capital cities of Europe. We returned from our Christmas visit to Toronto more resolved to bring that vision to fruition, and early last month we finally found ourselves in a position to do so, with a weekend trip to London, England. Kathryn had a series of meetings scheduled at Nestle’s UK office in Gatwick, and so we decided to tack a family visit to London onto the beginning of her trip. We pulled Emma and Lachlan from school at lunch on a Friday and whisked them off to Geneva where we grabbed a cheap flight to London. After a short train trip to Victoria Station we cabbed it to our hotel in Kensington, where we dropped off our bags before walking down to a local pub, the Blackbird Ale & Pie House, for a pint and, you guessed it, meat pies! 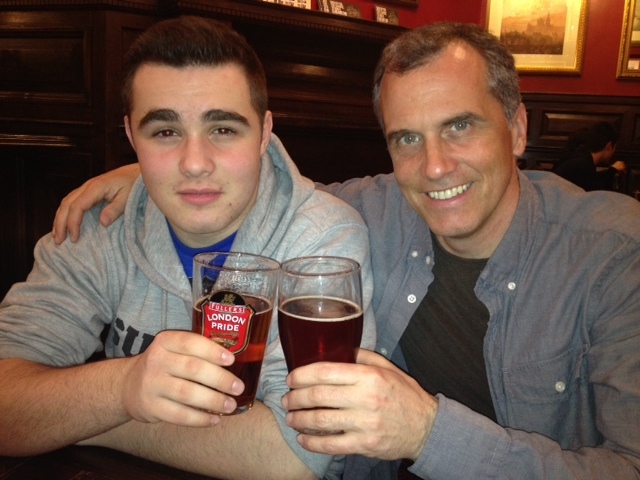 As we were within days of celebrating his 16th birthday, Lachlan enjoyed his first pint with us too (16 year olds can legally drink in the UK, in the presence of an adult, when consumed with food, it’s kind of a graduated system). Saturday morning dawned cold but bright and sunny. We managed to get the kids up and were heading for the local underground station, Earls Court, by 10 a.m., with a plan to hit up a few of the big tourist sites. Our first stop was Westminster, of course, where we hopped off the subway and strolled past the UK Parliament buildings to the sounds of Big Ben tolling the hour. We then headed across the Thames River on the Westminster Bridge towards our next stop, the London Eye, a nearly 450ft high observation ferris wheel, for a better look at the London skyline. It was on our way to the London Eye that I started to notice the sheer number of people on the streets and at the tourist destinations. Being early February, I had not anticipated encountering such hordes of people, even in central London. However, between the good weather and the fact that London is just an enormous city, there was no escaping the crowds. 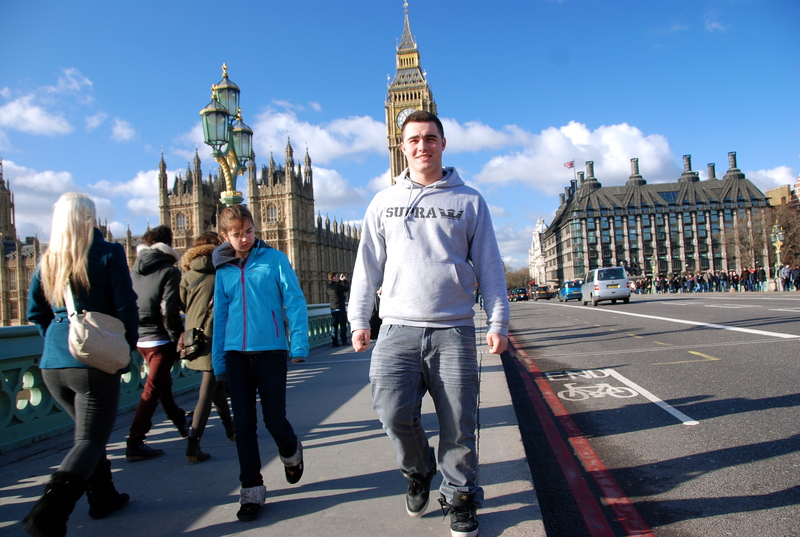 Fortunately we had purchased advanced tickets to the Eye, so we were able to more or less walk on. 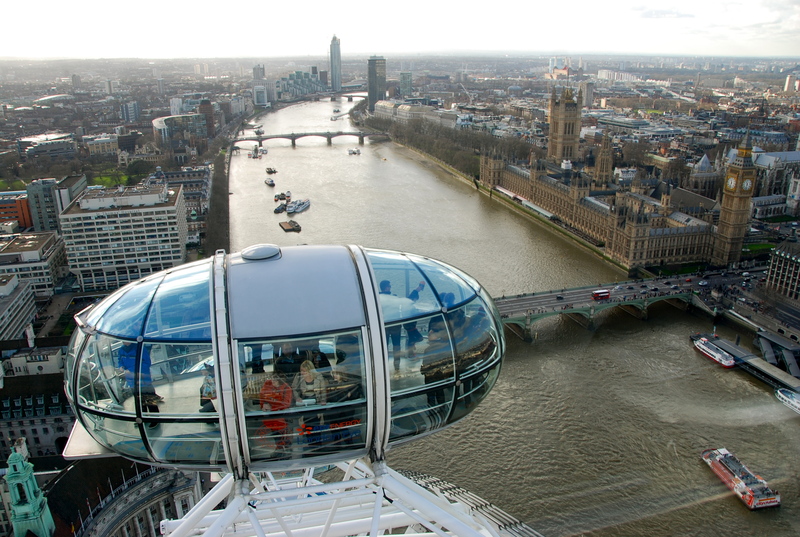 While the aesthetics of the London Eye leave a bit to be desired, looking like a carnival midway has been set up beside the Thames, it is an impressive structure that affords a fabulous birds-eye view of the downtown and beyond. Attached to the giant wheel are a series of large glass pods that hold 20-30 people each. One revolution around the wheel takes about 30 minutes. 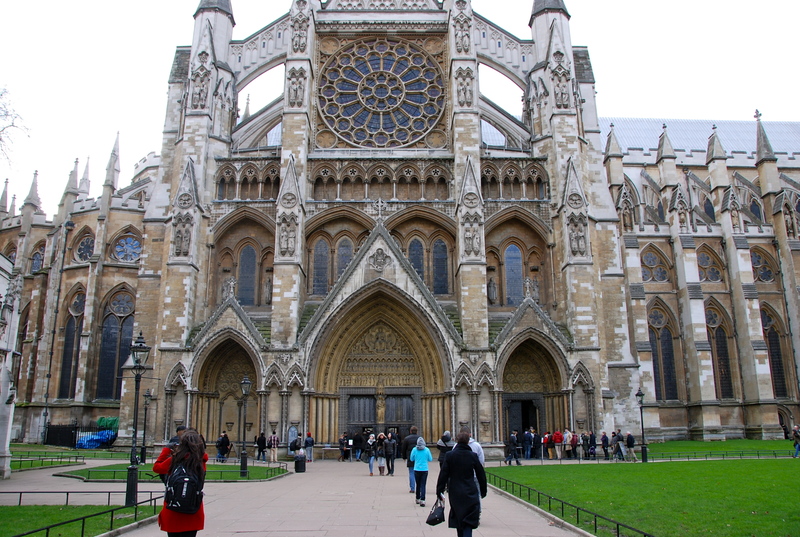 After our trip ’round the wheel we headed back across the river and spent an hour or so wandering through Westminster Abbey, which contains the tombs of various British kings, queens and nobles, along with famous writers and scientists. I was particularly struck by the beauty of the Henry VII Chapel, whose blonde stone, stained glass and colourful heraldic banners were beautifully enhanced by the afternoon sun. 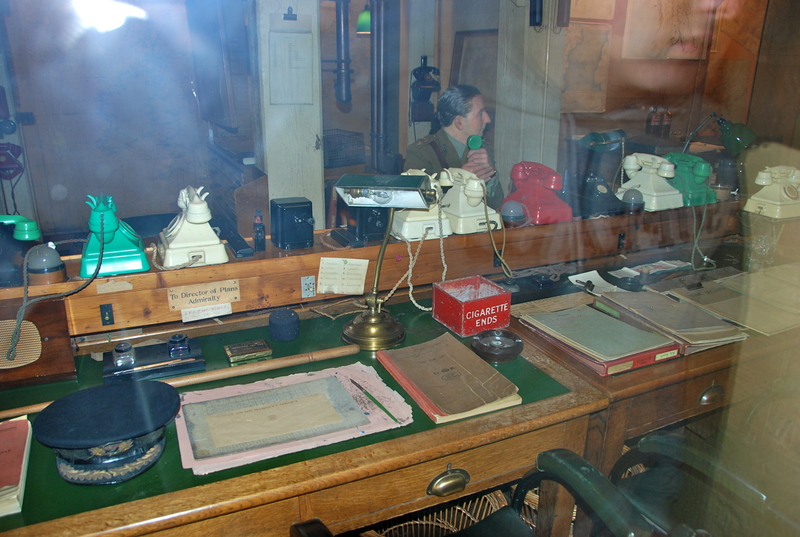 After Westminster we headed to the nearby Churchill Cabinet War Rooms. During the early days of WWII when London was under constant threat of aerial bombardment, a series of secret underground meeting rooms and living quarters were constructed for Winston Churchill, his war cabinet, and military high command. These rooms were used on a regular basis and left more or less as they were at the end of the war. We spent an hour or so wandering this labyrinth of hallways, rooms and tunnels. On display were, among other things, the room and radio equipment where Churchill broadcast some of his morale-boosting speeches, and a communications room with a series of colour-coded rotary phones, including the transatlantic hotline between Churchill and US President Roosevelt. After the Churchill War Rooms, Kathryn, Emma and I walked to Buckingham Palace via St. James Park and gave a quick wave to Her Majesty before hopping on the tube to go shopping near Oxford Circus. Lachlan, meanwhile, ditched the family to roam the city with his friend Charlotte, who recently moved to London from Toronto. If I thought the crowds at the London Eye were bad, I was in for a shock at Oxford Circus. The sheer volume and crush of people, cars and double-decker buses at the corner of Oxford and Regent Streets was pretty overwhelming. While Emma and Kathryn went off in search of a bargain, I flattened myself against the wall of a shop to avoid being trampled! Self-preservation eventually drove me out of the area and I found quieter streets just to north, where I stumbled upon the very cool looking All Souls Church and the headquarters of the BBC. After reuniting with Emma and Kathryn we went to check out Liberty of London, a retail institution in the neighbourhood. 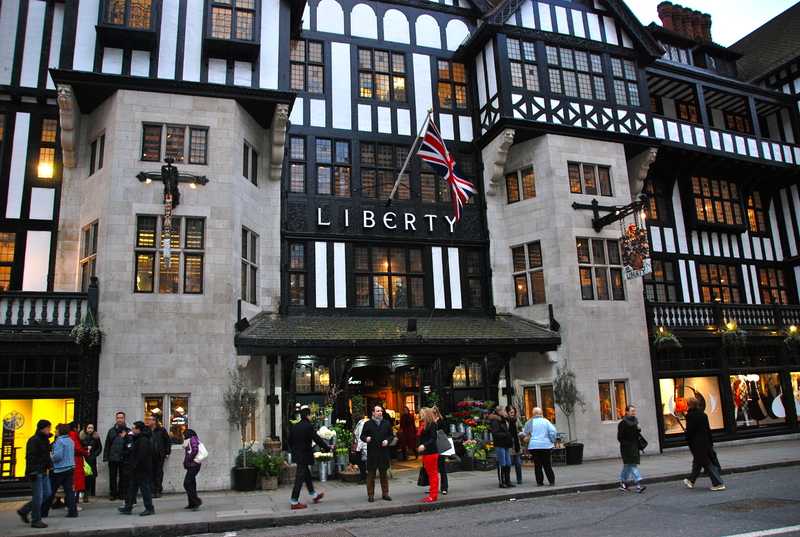 Opened in 1875, Liberty is a high-end retail store housed in a gorgeously preserved tudor-style building. Liberty has long been a bastion of English design and helped to popularize such design trends as the Arts and Crafts and Art Nouveau movements. Today Liberty is a mecca for fine textiles, scarves, and Moorecroft pottery, as well as designer fashions and accessories. After our shopping expedition we headed back to Kensington, where we met Lachlan and Charlotte for dinner at another local pub. Sunday morning we roused ourselves early in order to squeeze in a little more sight-seeing before heading to the airport in the mid-afternoon. We jumped back on the underground and headed to Covent Garden, where we wandered around the covered markets and watched a few street performers for a while. From there we walked over to Leicester Square, passing through the gentrified Neal’s Yard and the whimsical Seven Dials (where seven narrow streets intersect at once), along the way. Then it was back to the Blackbird for a quick lunch before Emma and Lachlan and I said our goodbyes to Kathryn and hopped on the train to Gatwick for our flight home. All in all we enjoyed a great weekend in London. Although the time flew by quickly, we saw a lot and had a great time. 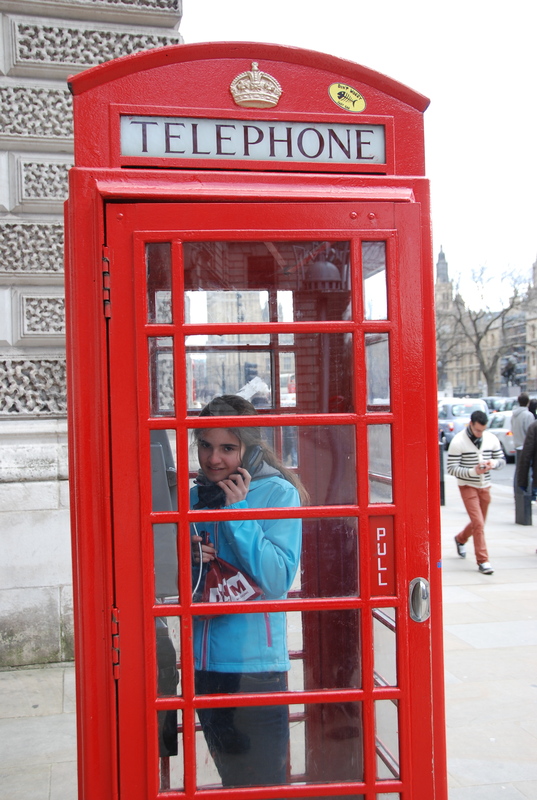 The travel logistics were a breeze and we found London very easy to get around, despite the crowds of people. Of course there was much that we did not see. Places like the British Museum, the Victoria & Albert Museum and the Tate Modern will just have to wait until our next visit! Looks like a world-wind trip – and indeed lots of tourists even at this time of the year.